More than a gratitude journal, the With Thanks Bible reading plan and journal provides 31 Scripture references ideal for one month of learning to count every blessing from the Lord. You long to show a grateful heart, but curating it requires more than a simple longing for it. Want to put true thanksgiving into practice? Use this Bible reading plan and journal as a reminder of the benefits of giving God thanks. Each day includes one focus word and simple memory statement to help you remember that giving thanks harvests a renewed spirit. A thankful heart truly is a happy heart! Specifically designed to help you remember to spend time with God each day and enjoy his love letter to you, the simplicity of this Bible reading plan and journal makes it one you’ll long to share with others. Through this Bible reading plan and journal, you’ll embrace a gratitude attitude and lift a thankful heart to God. Be inspired to advance from giving of thanks to living of thanks! More than a gratitude journal! 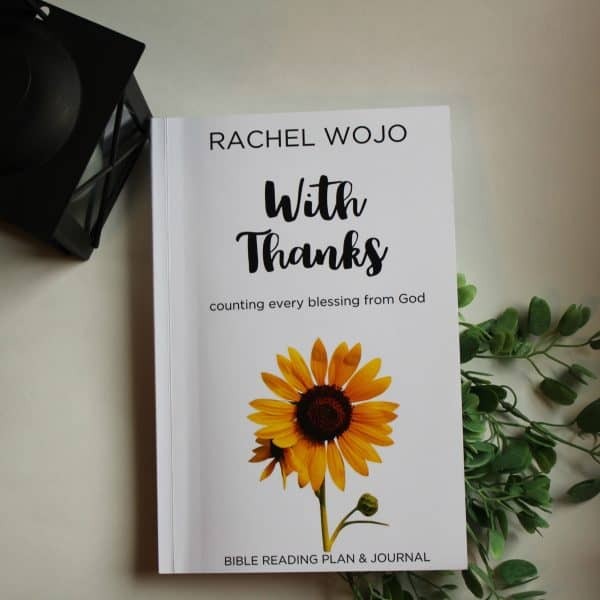 The With Thanks Bible reading plan and journal provides 31 Scripture references ideal for one month of learning to count every blessing from the Lord. You long to show a grateful heart, but curating it requires more than a simple longing. Want to put true thanksgiving into practice? Use this Bible reading plan and journal as a reminder of the benefits of giving God thanks. Each day includes one focus word and simple memory statement to help you remember that giving thanks harvests a renewed spirit. A thankful heart truly is a happy heart! Specifically designed to help you remember to spend time with God each day and enjoy his love letter to you, the simplicity of this Bible reading plan and journal makes it one you’ll long to share with others. Through this Bible reading plan and journal, you’ll embrace a gratitude attitude and lift a thankful heart to God. Be inspired to advance from giving of thanks to living of thanks!